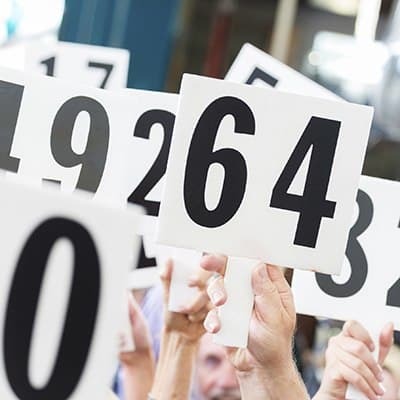 Auctions are typically held on a Tuesday and Thursday of each month. Units are sold as is, and the method of payment must be cash only. All auctions are conducted in accordance with the Virginia Self-Service Storage Act. Please see the complete list of rules, regulations and terms below. Security Note: Buyers must have a current and valid Government or State issued photo ID, must be 18 years of age or older, and are required to sign in with their full name, correct address, and phone number in order to bid. We sell the complete contents of the unit AS IS - WHERE IS - NO REFUNDS. We make no representations as to the condition or from where contents originated. If unit(s) is/are not cleaned out within 48 hours, or by the time specified and arranged with the Facility Manager, the contents will be disposed of by the storage facility, and any costs incurred for the disposal thereof will be the responsibility of the unit Buyer. YOU ARE BIDDING ON THE ENTIRE UNIT OR SUITABLE LOTS. The doors to units and containers will be opened and visual inspection can be made at that time. You are not permitted to touch any items. You should have your own flashlight, and locks to secure any units purchased. Storage facility will not be responsible for units without locks. Locks are available for sale at facility office. Method of Payment: CASH ONLY, or other terms announced by the facility in Legal advertisement. All bidders must have the funds on your person in order to bid, or your bid will be voided and resold by the Auctioneer. All units must be paid in full immediately following the sale, with a paid receipt shown prior to removal of contents. Deposit: Every Buyer will be charged a $25.00 cash deposit for each unit purchased. You are not allowed to use the dumpster on the storage facility property, nor may you use any other empty storage unit during vacate. All unit contents must be removed from storage facility. If unit is not vacated in its entirety or left broom clean, the cash deposit will be forfeited and Buyer will be prohibited from participating in future American Classic Storage operated facility auctions. The Buyer acknowledges that in circumstances of a wrongful sale, the storage facility has the right to contact the Buyer and request that the unit contents in the Buyer's possession be purchased back by the Storage facility to prevent court litigation. State Tax: All Buyers must have a copy of current Sales Tax Certificate to provide storage facility, or you will be responsible for the payment of Sales Tax on the unit price (State law). The Storage Facility and Auctioneer reserve the right to cancel any bids that in their sole opinion, are considered unreasonable. The Auctioneer reserves the right to refuse (not accept) any bid from any person who is disruptive or has caused problems at any other facility or auction. Auctioneer will not tolerate collusion of down-talking on units or other bidders. You will be asked to leave the premises and will be barred from future American Classic Storage operated facility auctions. Subject to errors and omissions and to any undisclosed liens: No warranties and/or guarantees are expressed or implied, including merchandise descriptions. Buyers are encouraged to inspect each lot and bid according to their own judgment. We are acting as agent and agent only, and are not responsible for the acts of the principal. Liability: You are responsible for your own safety and those with you at all times while attending each auction. Children must be kept in hand at all times and are not allowed to go near storage units. No animals or smoking allowed within facility. No guns or concealed weapons allowed on premises. Any oral statement from the auction block or any Facility Rules take precedent over any previously printed material, excluding Legal advertisement of sale. As a matter of courtesy, we request that personal items found in units be returned to the Storage Facility office (birth certificates, diplomas, legal papers, photo albums, etc.). This auction is conducted in accordance with Virginia Self-Service Storage Act.